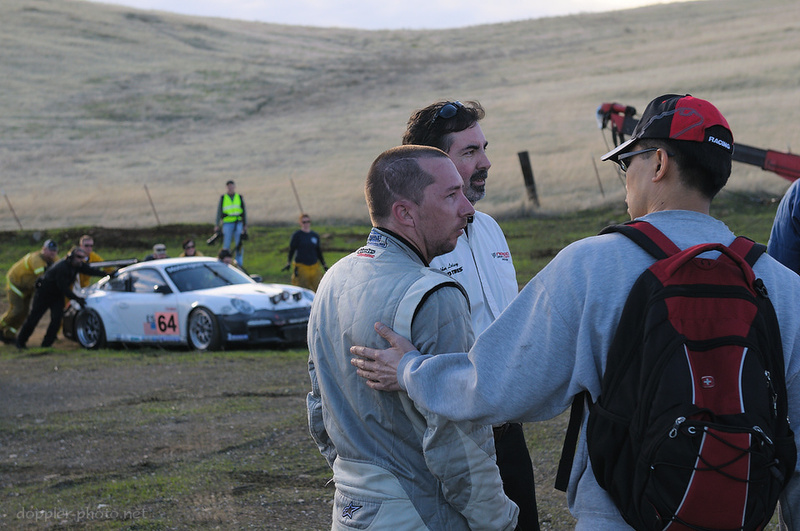 Back in December, I went to watch the first half of the 25 Hours of Thunderhill race, held up in Willows, CA. (Click here to check out the prelude). During my time there, I learned a bit about what it takes to finish, let alone to win, a long endurance race: preparation, skill, and a bit of luck. 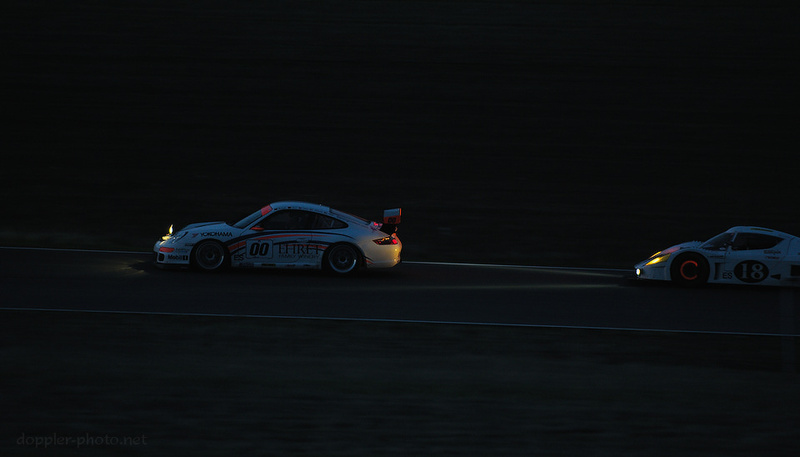 In the photo, brake rotors glow as the #18 Davidson Racing RCR Eagle chases the #00 Motorsport Solutions / Ehret Family Winery Porsche 997 Cup car into Turn 9 after nightfall. Slower lap times but superior reliability would have the #00 car win the race, 9 laps ahead of the #18 by the time the checker dropped. Contact happens. And while sometimes it's a bump or a rub and nobody's the wiser, other times, all involved parties end up getting towed back to the paddock for repair. In this instance, the #3 Tiger Racing / Bavarian Tuning Motorsport M3 got together with the #85 Boothman Racing FFR Roadster at the exit of Turn 2. The #85 spent 20 minutes in the paddock before heading back out as the mechanics on #3 were still in the midst of removing and replacing the M3's broken rim, punctured coilover shock, and broken trailing arm. 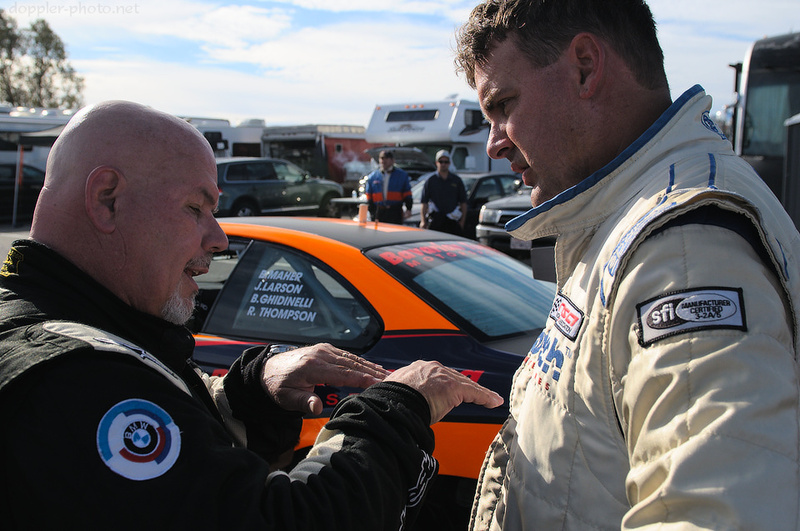 In the photo, the drivers of #3 (left) and #85 (right) discuss the crash and agree that the BMW driver was at fault (by NASA [National Auto Sport Association] fault-finding rules). Sometimes, your car just breaks, and there's not much you can do about it. The #34 034 Motorsports Audi TT-RS was one of my own main attractions for the race. It's one of the few (if not the only) front-wheel-drive Audi TT-RS cars in the world, and it uses large quantities of aerodynamic downforce to scoot around the track in a hurry. Of the 68 vehicles starting the 25-hour race, the #34 had the fifth-fastest laptime overall. Of course, speed doesn't help when your car isn't running. In the photo, a driver of the #34 car walks away from the vehicle as the automatic fire-suppression system activates during a stop, ejecting a cloud of fine dust. The team pushed the car into the paddock, and would retire with irreparable transmission damage after only 4h20m of racing. And sometimes you just can't catch a break. Maybe you've got a novel problem, you improvise a solution, and it just doesn't work like it was s'posed to. The #58 Rimicci Corse team faced hilarious and incredible odds in this race. Their incessant beating exposed the weak areas of their Fiat 500 Abarth by causing unexpected and often-catastrophic failures. In this case, the front-right wheel of the car had some failure which caused the end of the right front driveshaft to shear off completely. Then as they were trying to get the car into its paddock space with a creative arrangement of car jacks, one of the jacks simply rolled on its side. Oops? The team members have to have the skill and the practice to rescue bad situations with the least possible time impact (be that due to damage, penalties, down-time in the pits/paddock, or anything else). Here, friends and teammates check on the driver (center) of the race-leading #64 Motorsport Solutions Porsche 997 Cup car. The car lost all brakes due to a mechanical failure while heading toward Turn 10, which is at the end of a downhill, high-speed straight where the car was pushing 110mph. The driver managed to slow the car down enough and maintain enough control to avoid a concrete barrier, park the car on top of a berm, and then grab his fire extinguisher, get out, and douse a small brush fire that auto-ignited under the beached vehicle. At that point, the NASA safety crew showed up to recover the vehicle and tow it back to the paddock. Despite losing race positions after the incident, with some mechanical fixes and solid driving overnight, the #64 car had regained the lead by the time the sun rose over the track. Other mechanical issues bit two hours before the checker, however, and relegated the team to a seventeenth-place finish, 52 laps behind the leader. The pit stops need to be well-practiced and well-executed. While it can be very difficult to win a race in the pits, between lost time on the track and penalties for any infractions, it is often all too easy to lose a race there. Here, the pit crew for the #31 Hankook Tire / El Diablo M3 fuels with 5-gallon jugs in the background as the gravity-fed fuel rig of their neighbors (#90 BimmerWorld / Red Line Oil E92 M3) sits idle. The #31 car placed first in the E0 class (which doesn't allow the gravity-fueling rigs), and fourth overall. 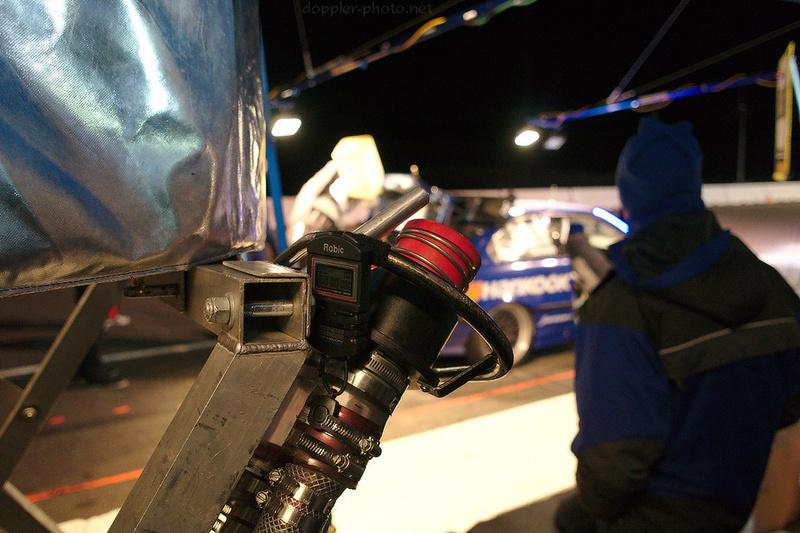 The stopwatch on the handle for the gravity rig is used to calibrate how much fuel to transfer to the car, in order to optimize the time spent in the pits. Last but not least, you can't finish well in an endurance race without good driving. The drivers need to not only be fast, but they need to be consistent, and they need to know when and how to conserve the car's resources. 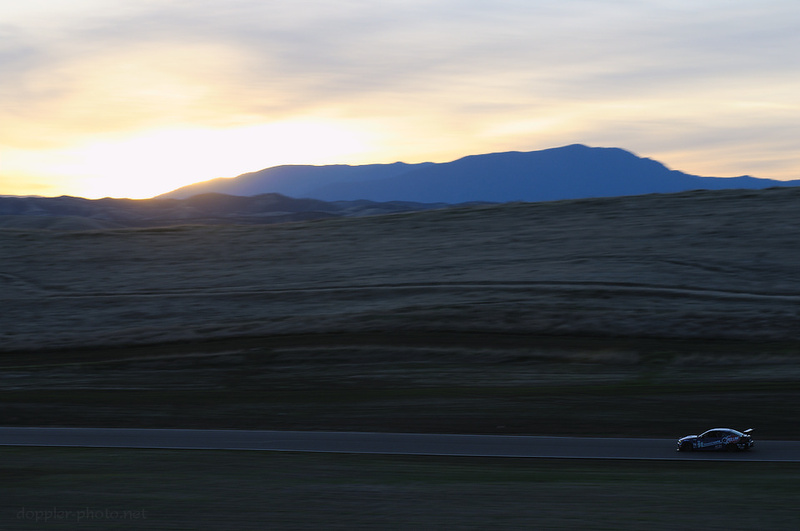 In the photo, the #90 M3 races past the sunset as the 25 Hours of Thunderhill rolls on. #90 would cross the checker in 12th place overall, after having to swap the differential about four hours into the race. Great photos and writeup. Thanks for sharing these.